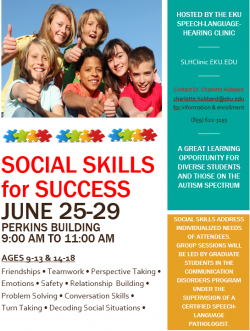 Under the direction of Dr. Charlotte Hubbard, EKU Communication Disorders graduate students lead preteens and teens (ages 9-18) in therapy activities to encourage social-skill development during Social Skills for Success Camp. Camp will be held June 25-29, 2018 from 9-11am at the Perkins Conference Center on EKU Richmond campus. The focus is on pragmatic language skills in adolescent children. Communication Disorders graduates individualize activities relating to friendships, teamwork, perspective taking, emotions, relationship building, conversation skills and much more. This is a great opportunity for students with a range of disorders that struggle in social situations; including, but not limited to, those students on the autism spectrum. Registration is $25 with a sliding scale available for those that qualify. For more information, please contact Dr. Charlotte Hubbard at charlotte.hubbard@eku.edu or 859-622-3155.